SSC Notification is out. SSC is recruiting for 100+ (Not Specified) Junior Engineer's Govt Job Posts. You can check SSC - Staff Selection Commission last date, download SSC notification, visit SSC official website and check other SSC Vacancy details.Complete Vacancy and recruitment Details about 100+ (Not Specified) Junior Engineer's Govt Job vacancies in SSC are provided below by JobSarkari.Com only for you. Last Date of Pay Application Fee. 25/02/2019. Date of Examination. March/ April 2019. SC/ ST/ PH. No Fee. Mode of Payment. Candidate Need to Pay Application Fee Through Debit And Credit Card, Net Banking or E Challan. Junior Engineer Civil. Candidate Must Have Passed BE / B.Tech Degree / Three Year Diploma in Civil Engineering. Max 32 Years. Junior Engineer Mechanical. Candidate Must Have Passed BE / B.Tech Degree / Three Year Diploma in Mechanical Engineering. Max 32 Years. Junior Engineer Civil. Candidate Must Have Passed Diploma in Civil Engineering. Max 32 Years. Junior Engineer Mechanical. Candidate Must Have Passed Diploma in Electrical/ Mechanical Engineering. Max 32 Years. Junior Engineer Civil. Candidate Must Have Passed Diploma in Civil Engineering. Max 27 Years. Junior Engineer Civil. Candidate Must Have Passed B.Tech/ BE Degree in Civil Engineering OR Diploma in Civil Engineering with 2 Year Experience in Related Field. Max 30 Years. Junior Engineer Electrical/ Mechanical. Candidate Must Have Passed B.Tech/ BE Degree in Electrical / Mechanical Engineering OR Diploma in Electrical/ Mechanical Engineering with 2 Year Experience in Related Field. Max 30 Years. Junior Engineer Quantity Surveying and Contract. Candidate Must Have Passed Diploma in Civil Engineering. Max 27 Years. Junior Engineer Civil. Candidate Must Have Passed Diploma in Civil Engineering. Max 30 Years. Junior Engineer Electrical. Candidate Must Have Passed Diploma in Electrical Engineering. Max 30 Years. Junior Engineer Mechanical. Candidate Must Have Passed Diploma in Mechanical Engineering. Max 30 Years. Director General Border Roads Organization. Junior Engineer Electrical / Mechanical. Candidate Must Have Passed Diploma in Electrical Engineering. Max 30 Years. Dte. Of Quality Assurance (Naval). Junior Engineer Mechanical. Candidate Must Have Passed Diploma in Mechanical Engineering with 2 Year Experience in Related Field. Max 30 Years. Junior Engineer Electrical. Diploma in Electrical Engineering with 2 Year Experience in Related Field. Max 30 Years. Total Vacancy. 100+ (Not Specified). 3. Candidate Can Fill All the Details in Application Form And Need to Upload All Mandatory Documents As Prescribed Size And Format. Q. What is the Last Date For SSC Junior Engineer's Govt Job Vacancy ? A. Last Date for SSC Junior Engineer's Govt Job Posts is 25/02/2019. Q. What is the Form Type of SSC Junior Engineer's Govt Job Recruitment ? A. The Form Type for SSC Junior Engineer's Govt Job Posts is Online. Q. 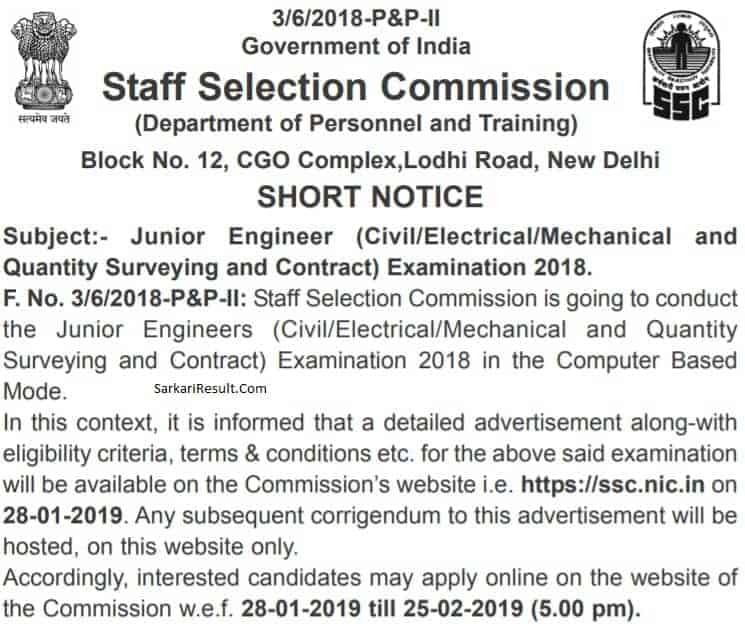 How many vacancies are available in Staff Selection Commission Junior Engineer's Govt Job Posts ? A. There are about 100+ (Not Specified) Vacancies in Staff Selection Commission Junior Engineer's Govt Job Posts. Q. What is the Full Form of SSC ? A. Full Form of SSC is Staff Selection Commission . can chemical engineers apply for this post? Yes You Can Fill The Form..